Only 3 ingredients, this coffee spice rub is super delicious on steak, chicken, salmon, scallops, shrimp and even tofu! It’s Healthy Kitchen Hacks Wednesday – the day we share our favorite time-saving kitchen tricks and cooking shortcuts to help you make healthy and delicious meals. Coffee lovers, this is for you! This coffee spice rub is so easy to make – with ingredients in your pantry – and it gives a super flavor upgrade to practically any protein you are cooking up. Chicken Thighs – Rub spice mix over thighs. Saute in a pan coated with oil for about 6-7 minutes per side or until a meat thermometer reads 165 degrees Fahrenheit. 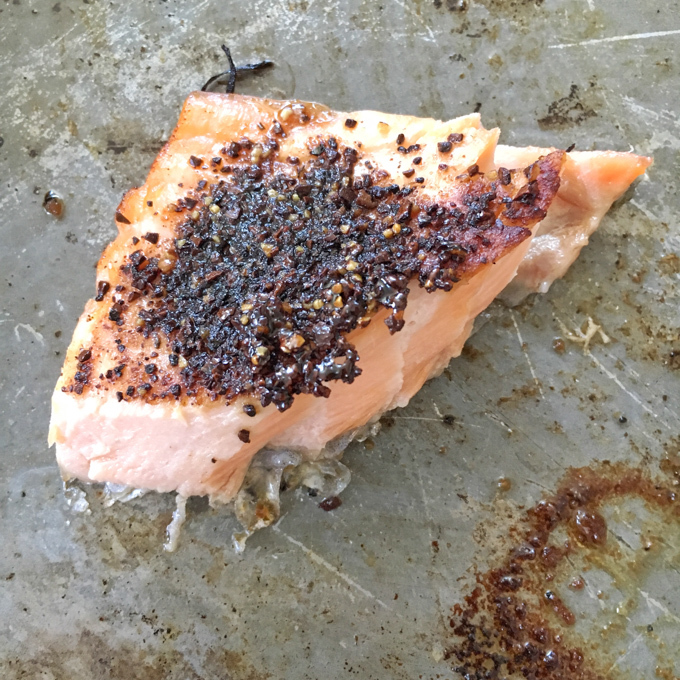 Salmon – Rub spice mix over top and place skin side up on a hot pan coated with cooking spray. Cook for about 5 minutes and then flip. Coat another 5 minutes or so (depending on thickness) until fish flakes easily and is cooked through. Scallops (my favorite!) 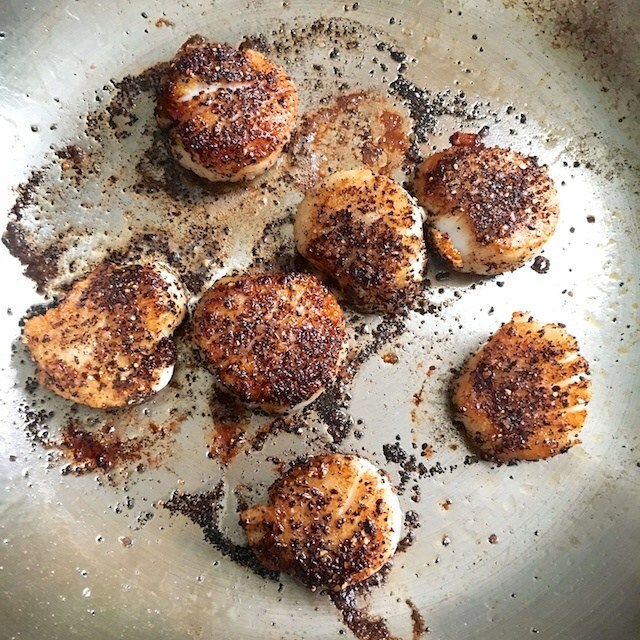 – Gently rub spice mix over scallops. Melt a pat of butter in pan over medium heat and then cook scallops about 2 minutes per side. Shrimp -Place peeled shrimp in a bag with rub and toss until coated. Saute in a pan coated in oil for about 5 – 6 minutes, stirring often. 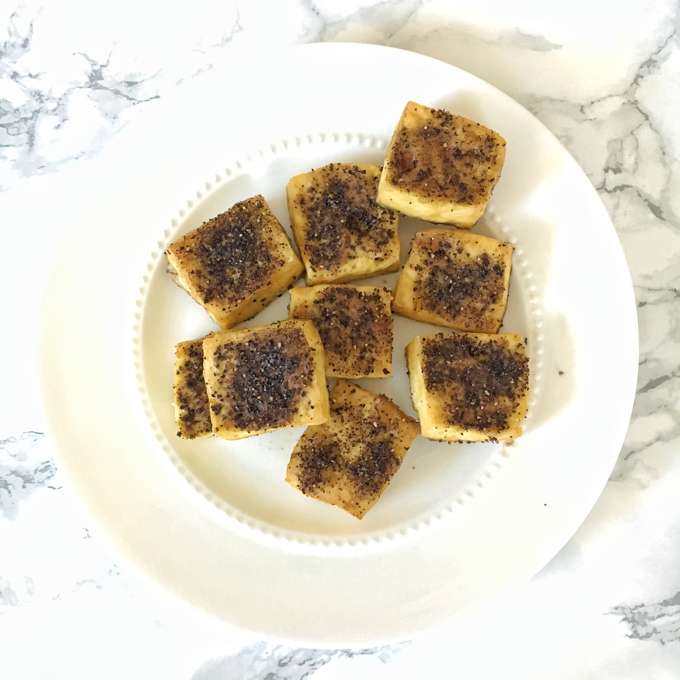 Tofu – Press extra-firm tofu for 30 minutes. Preheat oven to 400 degrees Fahrenheit. Cut into 2-inch pieces and rub with spice mix over both sides. Place on a foil lined pan coated with cooking spray. Bake for 20 minutes and then flip. Cook for another 20 minutes. Only 3 ingredients, this coffee spice rub is super delicious on steak, chicken, salmon, scallops, shrimp and even tofu! Mix all ingredients together well. If cooking one pound of chicken, scallops, salmon, tofu, etc., use HALF of the batch. Store the remaining spice rub in a sealed container in our spice drawer for up to 2 months. This coffee spice rub would also be delicious on steak, ham, pork, duck – the list goes on. You can double the batch and keep the extra in a sealed container in your spice door for up to a month. Have you ever used ground coffee or espresso your cooking? « Announcing our brand new 30-Minute Mediterranean Diet Cookbook! Love how simple this is! Those scallops look amazing. What an interesting spice, Deanna! Never thought of this, ever. So excited to try this one. Never thought using coffee like this. will try it tomorrow. Thanks, Deanna! 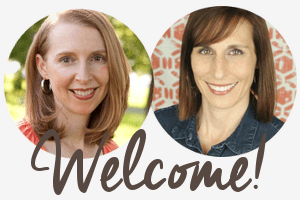 Whoot – lmk how it turns out!